I got a kindle for my birthday and it is seriously the best. I absolutely love it. As a bona fide commuter (complete with backpack and trainers) I felt the need to have one for the overcrowded and highly unpleasant train journeys I have to endure every day. 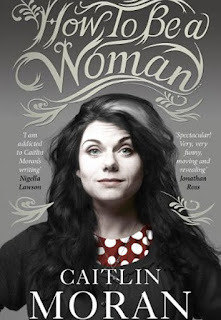 The single best purchase I've made is 'How to be a Woman' by Caitlin Moran. I love Caitlin, I follow her religiously on Twitter, slipped her name and quote into an exam and just generally idolise her. The inexplicable feeling that I need to put myself through considerable amounts of pain just so I can wear a thong at least twice a week. Crying your way through drinking sessions as you sit there silently worrying when you're going to feel a grown up, a woman, ready. I kept running down to Lee and shouting 'OH MY GOD, CAITLIN MORAN AND I ARE SOUL MATES' to which he almost always responded with 'bless you, she is very funny.' I haven't read a book in which I feel as connected with the author, and as a woman who gives a crap about feminism I'm so glad someone has written a humorous account of her views and experiences. For 3 years during university I studied book after book about theoretical feminism, which whilst interesting and eye opening it wasn't always relevant to me, or to the standard woman in the street. I think feminists are divided into two camps by people - the thinkers (classified as men hating lesbians who haven nothing else to do but write about how unjust the worlds is) and the doers (classified men hating lesbians who tear of their bras and have a huge amount of body hair). This book combines the best of everything to make a hilarious, moving and thought provoking account of one woman's efforts to feel like a woman. I can't recommend it highly enough. Please check it out. I really want to read this book, I keep reading great reviews of it! I'm glad you enjoyed the book but I've never even heard of her lol! I suppose that's probably because I hate feminism. Maybe I'm just ignorant but ah well... lol! This sounds great haha! Will have to give this a read soon! This is such a good post, I really want to read this book now! I love it when you find someone who can really inspire you. I really want a kindle as I'm also a commuter and it's so difficult carrying my books with me! I really need to treat myself to one. I got a kindle or my birthday as well, and I absolutely love mine too! i'm not too familiar with Caitlin Moran since I live in the states, but i love seeing intelligent and funny women in the media!